Explanation: Both land and sky were restless. 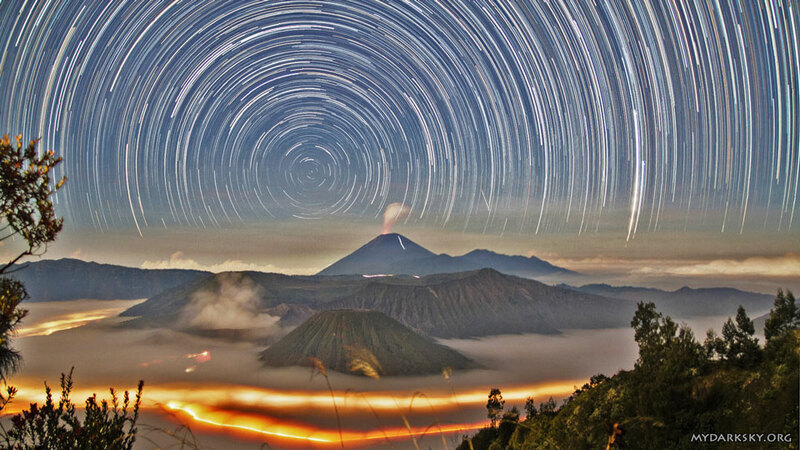 The unsettled land included erupting Mount Semeru in the distance, the caldera of steaming Mount Bromo on the left, flowing fog, and the lights of moving cars along roads that thread between hills and volcanoes in Bromo Tengger Semeru National Park in East Java, Indonesia. The stirring sky included stars circling the South Celestial Pole and a meteor streaking across the image right. The above 270-image composite was taken from King Kong Hill in mid-June over two hours, with a rising Moon lighting the landscape.